There is no doubt that these words were also spoken by the enemies of the Lord, our Saviour, when they, returning from the terrible Golgotha, frequently repeated these words with Satanic joy: It is finished! We have finally reached the goal we desired so ardently: Jesus of Nazareth, our implacable accuser, is no longer alive; no longer will we hear His powerful, fiery words, so unbearable to our conscience, always placing us in a shameful situation before these ignorant people who are ready to deify Him, to follow Him into the mountains and the deserts, to hunger with Him, only to listen and listen to Him endlessly! Yes! He is no more: now we have nothing to fear, now we are complete masters, leaders of the people, and the people will follow us like mute and obedient animals, while gradually forgetting Him, this man of Galilee, and His new teaching will disperse like a cloud, like smoke in the wind, and we will quietly live as we wish… It is finished: it is over, He will no longer follow us like a stern shadow, like an implacable Judge! Thus rejoiced the scribes and the Pharisees, the iniquitous Jewish high priests and the Sadducees, celebrating their victory over the Prophet from Galilee. But let us turn away from these proud members of the Jewish intelligentsia, depraved to the core, these opponents of God and murderers of Christ. Let our thoughts and hearts turn to the sacred Golgotha. Here is being accomplished the great mystery of our salvation. Here is being offered the precious Sacrifice of atonement for the whole of mankind. 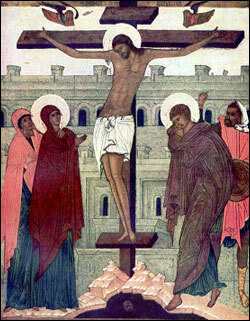 Here the Lamb of God, Who has taken upon Himself the sins of the entire world, is dying on the cross. There He is, crying out in indescribable anguish of torment on the cross: “I thirst!” There He is, being offered vinegar to drink. And now we hear from His divine lips those majestic, those eternally significant words: “It is finished!” It is finished! – He cried out in the knowledge of having fulfilled the great mission entrusted to Him by the Heavenly Father: “I have finished, Father, the work which Thou hast given Me to accomplish!” It is finished! – He proclaimed triumphantly, celebrating victory over hell and death. It is finished! Only this very morning, on this great day which is unique in the history of mankind, hell and death reigned powerfully over mankind, and now, in this sacred and mysterious hour when the Lord lowered His head, obedient to the will of the Heavenly Father, and gave up His spirit, hell is already moaning, death is already lying prostrated; the long-awaited hope of mankind has been fulfilled – the promised Reconciler of heaven and of sinful earth, of man begotten in iniquity and of the All-holy God has appeared and accomplished His mission; human frailty has been encompassed by divine love, and this love has canceled out all the debts of penitents, i.e. of sinners who thirst for salvation… Who, what mind – I am speaking not only of human mind, but of angelic also – what created mind is able to encompass and fathom the entire grandeur of our salvation, accomplished by the love of the Son of God? O come and worship this holy sepulcher which conceals within itself the Source of our life, our eternal salvation, our boundless rapture! O come and worship this Source of life, the Life-giving Lord, and let us weep before Him, let us weep with tears of profound repentance of our sins, repentance without self-justification, in the simplicity of a loving heart weeping in the presence of a loving Father, Who loves us more tenderly than any mother on earth, Who nourishes us with His body and His blood, – let us weep with tears of firm and immutable repentance! Behold, all of this – these wounds from the nails, this pierced side, these wounds from the crown of thorns, this sepulcher – all of this is for the sake of man and his salvation! All of this is exclusively the work of God’s love, which involved God’s wisdom, and God’s omnipotence, and all of God’s perfection in this great work. And now this boundless Love speaks in our conscience: My people, My beloved vineyard! What more must I do for you? What have I not yet done? I waited for you to bring Me the fruits of good deeds, but you bring only the thorns of sin. How long will this last? How long will I suffer you? The span of your life is moving along, moving towards its end, yet you continue to stagnate in your habitual and beloved sins, you stagnate in them and your heart becomes conjoined with them more and more, your souls becomes coarser and coarser, your conscience sleeps, becomes earthen, your spirit turns into flesh.. There is a limit to everything: there is a limit even to God’s forbearance…. Brethren! Who among you has not yet repented? Who has not yet united with the Lord in the most holy sacrament of Communion? Hasten to do this immediately, open your sinful wounds before this sacred sepulcher, and tomorrow you can approach the Lord’s Chalice… The forthcoming bright feast of the Lord’s Resurrection brings shining joy to a believing heart. Now is the favorable time, now is the day of salvation! O most-merciful Lord, crucified and laid in the sepulcher for us! You have disposed the heart of the wise thief who was crucified with You towards repentance, You have touched the hearts of those who returned from the terrible Golgotha beating their breast! Soften also our hearts and open our eyes to see the whole sinful abyss into which we have fallen, extend to us Your saving hand from Your sepulcher, and before we come to our end, grant us that we may here and now shed bitter tears of heartfelt remorse, never to return to the path of sin and eternal damnation! Amen.